Traffic Police Department of Indore has approached IIM Indore for a study regarding improving traffic condition in the city. Professor Himanshu Rai, Director, IIM Indore is leading this study along with Professor Saurabh Chandra and Professor Rajhans Mishra, Faculty Members, IIM Indore. The team had started this study in January 2019 and has worked extensively in the research work via surveys and inspections of various crossings and signals around the city. 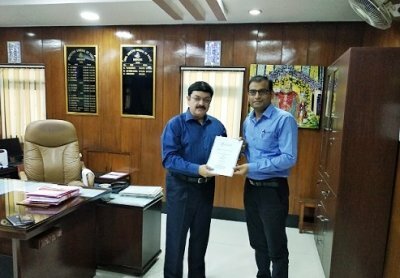 Professor Rajhans Mishra handed over the report to Mr. Varun Kapoor, ADG, on April 09, 2019. Mr. Umakant, DSP-Traffic was also present during that time. The report focussed on accident prevention and capacity management across the city. It also mentioned various traffic management tips according to the requirements by the year 2025. The team also proposed a new circular ring road covering entire city and connected to all the highways coming to Indore. Fly-overs on important crossings like (White church, Geeta Bhavan, Rau circle, Bhavarkuan etc.) were recommended. Elevated paths in congested areas were also suggested. Google Traffic Data is used to analyse the traffic. Suggestion for extended left turns at important crossings to avoid blocking of left turns. Integrated Traffic Management and Monitoring System with Red Light Violation Detection (RLVD) and Automatic Number Plate Recognition (ANPR) systems in all Category “A” signals is required. Safety Audits of Roads on regular interval are required. Development of Intercity Bus Terminal at Bypass near Vijay Nagar along with Intercity Bus Stands for passengers at various places was recommended. Development of Feeder systems for public transport will also be useful. Another Stretch was recommended from Palasia Square to Vijay Nagar Square via LIG Square through AB Road. During the project IIM Indore team got continuous support from DSP Traffic Umakant and ASP Traffic Mahendra Kumar Jain.